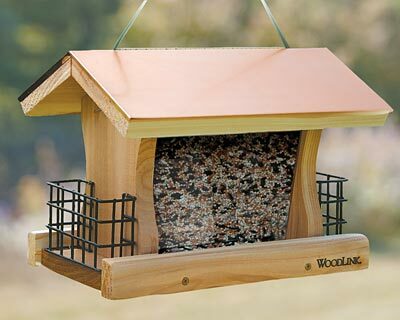 The Woodlink Coppertop Deluxe Seed & Suet Bird Feeder attracts a variety of birds by offering a wide selection of foods. This classic hopper style feeder features ample perching at seed feeding stations on both sides of the feeder, perfect for feeding a flock of your backyard birds. Two suet cages on the ends of the feeder allow youto nourish an even wider variety of birds. With feeding stations on every side of this feeder, you will be sure to see a large number of birds dining at once. The clear plastic panels keep the seed level visible at all times. The generous 4 quart capacity will keep your birds from going hungry and reduce the number of trips made outside to fill the feeder. The roof is hinged to make cleaning and filling quick and convenient. The feeder is made of durable, kiln dried inland red cedar and a copper roof that will add rustic elegance to your birding sanctuary for years to come. As it ages, the copper roof will acquire a striking patina that complements the aging cedar well. The black vinyl-coated steel suet cages measure 5" x 2" x 3" and are open at the top for placement of standard suet blocks. This feeder may be hung using the included brown nylon cord. Made in the USA.